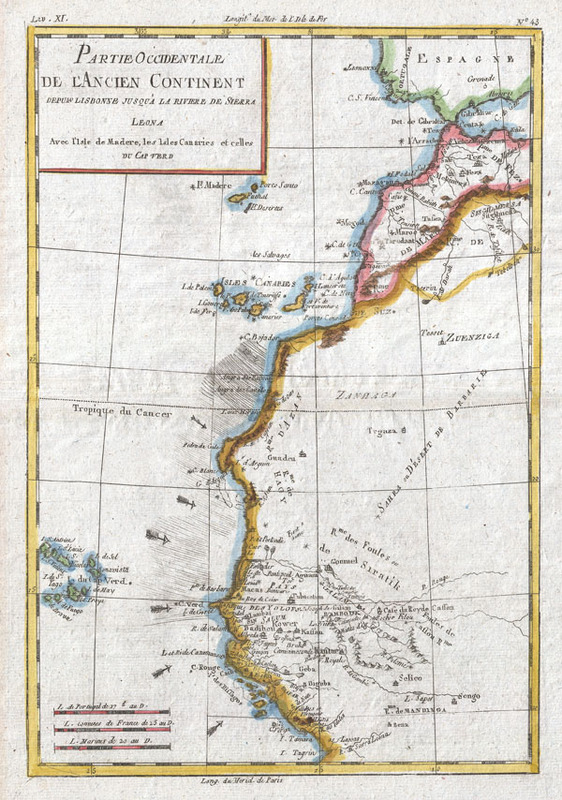 A fine example of Rigobert Bonne and G. Raynal's 1780 map of Western Africa. This area corresponds to modern day Morocco, Western Sahara, Mauritania, and Algeria. Includes the Canary Islands, Madeira Island, and Cape Verde Islands. Offers minimal inland detail reflecting the paucity of knowledge about the interior of the continent at the time. The exception is the Senegal and Gambia river valleys extending inland from Cape Verde, which at the time were just being mapped by explorers and missionaries. Arrows and hachures shows some o f the ocean currents and winds that made this region so difficult to davigate in the early days of African exploration. Drawn by R. Bonne for G. Raynal's Atlas de Toutes les Parties Connues du Globe Terrestre, Dressé pour l'Histoire Philosophique et Politique des Établissemens et du Commerce des Européens dans les Deux Indes.